T-L Linear Irrigation Systems use up to 60% less water than flood irrigation and cover almost 98% of a rectangular field. Critical to higher value crops, T-L’s continuous movement performance delivers the most precise water pattern available, most important when chemigating. T-L’s simplicity allows one person to effectively manage many systems. With linear irrigation systems, the majority of the water is not needed at the outer end of the system reducing friction loss. Each sprinkler system distributes an equal amount of water regardless of its position on the system, making it ideal for low-pressure applications. T-L Linear irrigation systems, available from Shore Irrigation , share the same hydrostatic design features as our pivots and can operate from a furrow, above-ground cable or buried wire. Water can be supplied from ditch, or hose-drag sources. You can make your choice, hard or soft hose in sections up to 660′ and a variety of diameters to fit your application. 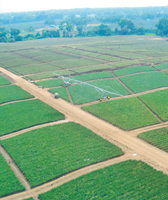 T-L’s one-span linear irrigation system can irrigate complex combinations of smaller and irregular systems. Preferred for specialty crops, experimental stations, and hybrid seed operations, they can irrigate variable widths and can accommodate water supplied by 3″ to 5″ diameter drag hoses.